The 1912 Gage biplane in the NASM collection is referred to as the Fowler-Gage, in recognition of its owner and pilot, Robert G. Fowler. The 1912 Gage biplane in the NASM collection is referred to as the Fowler-Gage, in recognition of its owner and pilot, Robert G. Fowler. Beginning in October 1912, Fowler made numerous exhibition and passenger flights in California. He made his most famous flight in the airplane in 1913, flying ocean-to-ocean across Panama. With the Gage now on floats, Fowler started his Isthmus of Panama crossing with a takeoff from the Pacific side at 9:45 a.m. on April 27. It was an extraordinarily dangerous flight, with no open areas available for emergency landings. Nevertheless, he completed the 83 km (52 mi) flight in one hour and 45 minutes, landing with his passenger/cameraman, R.E. Duhem, at Cristobal at 11:30 a.m.
Fowler continued to perform further exhibition and passenger-carrying flights, as well as flying linemen on inspection trips over the transmission lines between Sacramento and Oraville, California, for the Great Western Power Company. He retired the airplane in 1915. The 1912 Gage tractor biplane in the NASM collection is generally referred to as the Fowler-Gage, in recognition of Robert G. Fowler, who owned and flew this airplane. Fowler learned to fly at the Wright school in Dayton, Ohio, in the summer of 1911. Following his training he shipped a Wright Model B airplane to San Francisco for a try at the $50,000-prize offered by newspaper publisher William Randolph Hearst for the first U.S. transcontinental flight in thirty days or less. After a number of unsuccessful tries, Fowler finally completed a flight from Los Angeles to Jacksonville, Florida, between October 18, 1911, and February 8, 1912. It was a noteworthy flight, but it was completed after Cal Rodgers made the first transcontinental crossing by air late in 1911 in his famous Wright EX called the Vin Fiz. (Rodgers did not receive the $50,000 Hearst prize, as he exceeded the thirty-day limit.) Fowler spent the spring and summer of 1911 fulfilling exhibition dates in the South, and then returned to California in October 1912 to take possession of a new Gage airplane that he had purchased. The history of the builder, the Gage-McClay Company, is somewhat unclear. J. Gage is known to have established an aviation school at Griffith Park by late 1911. Early the following year he was marketing an interesting pusher biplane that was characterized as "well built and practical." In March 1912, Cleve T. Shafer, a California aeronautical enthusiast, offered the first long description of this first Gage machine in the popular aviation magazine, Aeronautics. Later in 1912, the firm began to produce tractor biplanes of the type now in the NASM collection. At least four Gage biplanes were constructed. They were flown by four well-known aviators of the day, Roy Francis, Phil 0. Parmalee, J. Clifford Turpin, and Robert G. Fowler, all of whom were trained at the Wright school or flew on the Wright exhibition team. Each airplane was initially fitted with a 60-horsepower Hall-Scott engine and a 2.1 m (7 ft) propeller. The upper wing had a span of 13 m (42 ft 8 in), while the lower wing spanned 9.1 m (30 ft). One-and-half-meter (5 ft) extensions were available for the lower surface. With these extensions in place, the aircraft had a top speed of 96 kph (60 mph). The control system was reported to be of the "Farman type." This arrangement used a single right-hand lever to provide aileron and elevator control, and a foot bar controlled the rudder. Fowler picked up the NASM Gage at Griffith Park field in Los Angeles in October 1912. On October 19 and 20, he flew an exhibition at Constan's ostrich farm in Pasadena, and on November 7 he left Griffith Park for San Francisco in a race with a Cadillac automobile. At Saugus, one of the stops along the route, Fowler crashed on takeoff, but with little injury to himself or damage to the airplane. In November 12, 1912, Fowler and his Gage airplane began a week-long series of appearances at the Empress Theater in San Francisco, the pilot lecturing with his aircraft behind him on the stage. On November 22 he flew the Gage from San Francisco to Gilray and back and in December flew in a competition at San Francisco's Tanforan Park. Early the following year he continued flying in the San Francisco area with passenger and exhibition flights. Some time during this period Fowler replaced the original 60-horsepower Hall-Scott engine with an 80-horsepower Hall-Scott, and fitted the Gage with floats. With the Gage upgraded, Fowler made his most famous flight in the airplane in 1913. He signed a contract for an ocean-to-ocean cross-Panama flight in March. Plans were made to carry a cameraman on the flight to record the event on film. Fowler and his support crew sailed for Panama on April 1, and by April 12 he was making test flights in Panama City. Robert Fowler started his Isthmus of Panama crossing with a takeoff from the Pacific side at 9:45 a.m. on April 27. It was an extraordinarily dangerous flight, with no open areas available for emergency landings between the takeoff point and the final destination. Treacherous winds over the rough terrain and the ever-present possibility of a sudden change in the weather compounded the difficulties. Nevertheless, he completed the 83 km (52 mi) flight in one hour and 45 minutes, landing with his passenger/cameraman, R.E. Duhem, in the shallow water at Cristobal at 11:30. Fowler returned to the United States that summer to perform further exhibition and passenger-carrying flights. He also made occasional theatrical appearances to narrate his Panama flight footage. He continued this activity, and ran a flying school, through 1915. Fowler and his Gage participated in a number of special projects in this period. One of the most interesting began late in 1913. In December Fowler won a contract with the Great Western Power Company to fly linemen on inspection trips over the transmission lines between Sacramento and Oroville. If a break in the power lines was spotted during the 112 km (70 mi) trip, Fowler was to land the repairmen to fix the line on the spot. The trips were scheduled several times a week, but it is not certain how many flights were actually made. On another occasion Fowler and the Gage were employed to carry Christmas mail to Sacramento. 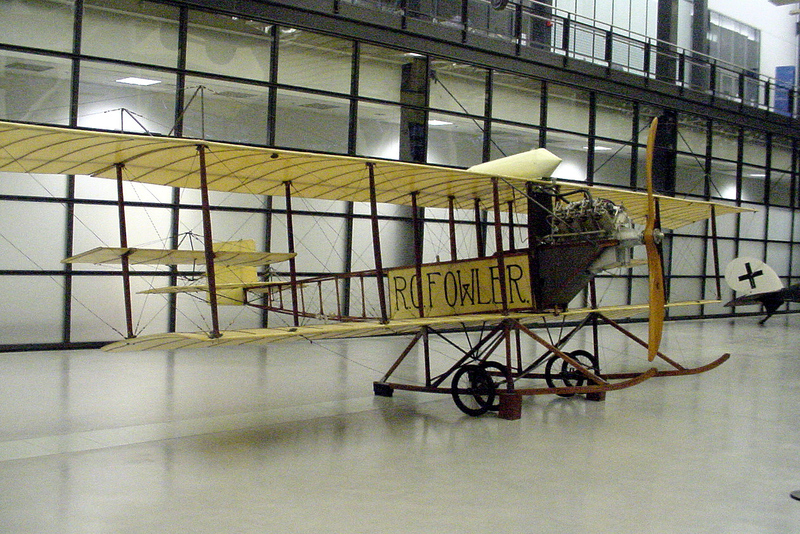 Fowler retired the airplane in 1915. In August 1950 Robert Fowler donated the Gage, without an engine, to the Smithsonian Institution. It was restored by the National Air and Space Museum in 1987-1988. Ideally the museum would have installed a 60- or an 80-horsepower Hall-Scott engine, but none was available at the time. Fowler reported that he had installed a Curtiss OX in the airplane when he set it up for a public display in 1939. The aircraft was not flown with this engine, however. Even though it was not the most desirable solution to the missing engine dilemma, the museum chose to mount an OX-5 from the collection until such time as a Hall-Scott becomes available. Gift of Robert G. Fowler. Tractor biplane with one 90-horsepower Curtiss OX-5 V-8 engine. Open-frame fuselage. Double wheel landing gear with forward protruding landing skids. Natural finish overall with black markings.